Your home kitchen is perhaps the main focal point of your entire home. Its benefits can range from improving the general comfort and atmosphere of your home to possibly increasing the value of your property. 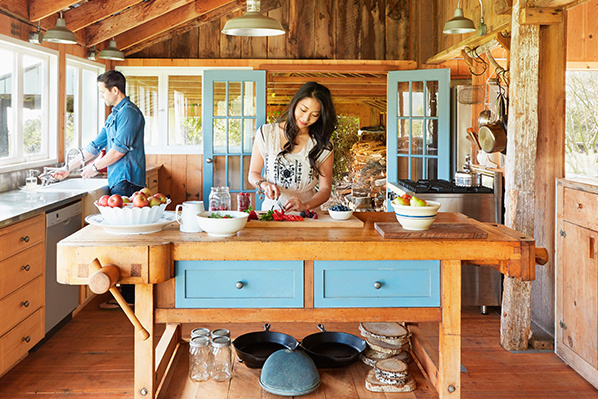 According to a new 2017 study commissioned by Houzz, an online community focusing on home design, a third of homeowners actually reported living a healthier lifestyle after a kitchen renovation. That includes eating more fruits and vegetables as well as preparing more meals at home. While spending your own time and effort helps limit the costs, many homeowners hire professionals to speed up the process and do the job right. The top professionals hired by homeowners renovating their kitchen are general contractor (54 percent), cabinetmaker (29 percent), and kitchen designer (25 percent). And what are the main items homeowners are upgrading? Nearly all are upgrading their countertops (95 percent), followed closely by backsplash at 90 percent and sinks at 89 percent. Should You Go Ahead And Design a New Kitchen? The trigger that leads to a re-design for homeowners is simply not being able to stand it – 43 percent of renovating homeowners listed that as their top reason. In addition, 40 percent listed that they wanted to do it all along but just now have the financial means necessary to complete it. The study highlights the benefits of a newly designed kitchen, including 49 percent of homeowners spending more time as a family and 40 percent doing more entertaining for friends and family. Those alone may be a good reason for your new kitchen, but 34 percent are also eating less takeout which is often less healthy and more expensive. Some homeowners (24 percent) unfortunately were forced to upgrade their kitchen due to deterioration or unsafe appliances. What Are the Costs of Kitchen Renovations? In 2016, spending on kitchen renovations increased once again. “Nearly one in 10 homeowners spent more than $100k on a completed renovation”, which was up 9 percent year over year, according to the Houzz study. Those spending between $50k – $100k went up 20 percent as well. And as you might expect, the initial budget homeowners planned often didn’t cover the entire cost of the project. Which Appliances Are Being Upgraded? For those updating appliances for the sake of energy efficiency, a green loan may help with the cost. While white cabinets remain the most popular at 42 percent, wood now accounts for 29 percent of all cabinet finishes. Stainless steel is clearly the top choice for appliances coming in at 72 percent. When it comes to flooring, wood accounts for 48 percent overall with medium colored wood, gray, beige, brown, and light colored wood all being the most popular options within that. Wall colors still have more of a variety than appliances and flooring. In fact, gray is 26 percent of all choices while 24 percent opt for beige, 17 percent for white, 9 percent for green, and 6 percent for yellow. “Custom remains king” according to the study with two in five updated kitchens including custom cabinets, although that is down 4 percent year over year. Semi-custom cabinets account for 36 percent as well. Apparently the older you get, the more custom cabinets you prefer (or can afford) as 42 percent of those ages 55 and older went with the custom option while only 37 percent of ages 35 to 54, and 32 percent of ages 25-34, opted for the same. For countertop decorative choices, granite remains the most popular at 41 percent with quartz at 40 percent. It may be surprising to learn that marble accounted for just 5 percent of kitchen renovations. Overall, there are many factors to consider when renovating your kitchen. But given its importance to your home and the benefits described above, it may be worth knowing what everyone else is doing. Need a loan for your home remodeling or repair project? Consider a Discover Personal Loan for up to $35,000 without using your home as collateral.